In a society that praises bigger as better, it is easy to forget the virtue of tiny. Don’t get me wrong, given half the chance I would love a bigger garden! You can keep a larger house – higher energy bills and more cleaning, who needs that! – but half as much garden again would be lovely. But then I spend time in my funny little yard and fall in love with its nooks and crannies, or I see what other small space growers (like @VerticalVeg) are doing with theirs and I’m inspired by the possibilities, joy and beauty that even the smallest of spaces can offer. 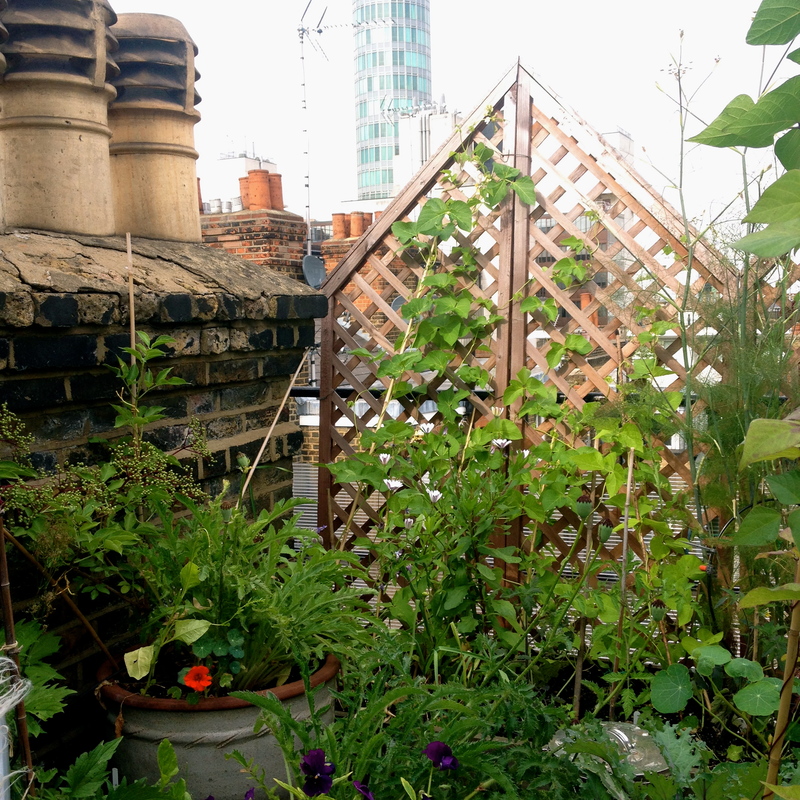 And no more so than after a visit to a tiny rooftop vegetable plot in Central London. Advocates of “Ever bigger” forget that constraints of any kind stretch our imagination and Wendy certainly has that in droves. Like any balcony/patio grower, she relies on raised beds but with an eye for beauty she has turned her four tiny 6 inch deep beds into edible borders that would look at home in a cottage garden. Like the bed of salad leaves edged with a mini Hyssop hedge acting as a windbreak and purple pansies, or one with feathery kale intersown with carrots and faster growing catch crops like rocket and radish. Small space growers love the productive potential of vertical growing and Wendy is no different. She has installed small trellises and a pergola that not only help define the space architecturally but are home to cottage garden regulars like climbing beans, peas (in particular Mr Prue’s extremely tall variety) and fragrant sweat peas. She has also made space for a trombocino courgette, which is doing a good job of clambering up one of the trellises. By including old-school perennials and biennials, like Valerian and Wild Celery, Wendy adds height, a shot of colour and a floral wispiness, adding to the sense that you are surrounded by borders rather than raised beds. Every where I looked in this tiny space there was a new discovery, inspiration for how to make the most of your space and always beauty. The small greenhouse is home to the usual suspects: tomato, pepper and cucumber plants but also basil and flowers like Calendula, Nasturtium and Antirrhinum for pest control purposes. A shadier corner houses an old chest that Wendy has turned into a hybrid compost bin/wormery. In some beds, she has strategically laid chicken wire on the soil to deter slugs from nibbling her kale and other leafy vegetables. Elsewhere climbers are working their way up a vertical compost bin (a cylinder made of chicken wire, half a foot wide and two foot tall). And then there is the tiny blue shed. This minute space is not relegated to housing a ramshackle collection of pots and tools but functions as a writing shed – every bookish girl’s dream. The pots, equipment and seeds are instead housed in the porch to the stairs down into building…, which Wendy aptly refers to as the potting shed! If you need proof that lack of space is no bar to a beautiful and abundant garden, take a look at Wendy’s blog and follow her Rooftop Veg Plot adventures. Actually, just follow her blog for the sheer joy that a beautiful garden offers! I certainly came away from my visit buzzing with ideas, unable to sleep with excitement at the number of opportunities I have not even started to explore in my sizable* garden. * With one and half times Wendy’s growing space, my garden is positively palatial!